Biarritz  is a famous holiday destination located in the Pyrénées-Atlantiques département of Aquitaine, France. Biarritz lies on the Bay of Biscay, on the Atlantic coast, in southwestern France. It is adjacent to Bayonne and Anglet and 11 miles (18 km) from the border with Spain. Biarritz train station is 2 miles (3 km) from the town centre. The local bus company runs the number 2 bus to the beach front for €1. For information on trains to and from Biarritz, visit the SNCF website . About 5 hours via TGV, trains running direct several times a day. There is also a Paris-Biarritz night train service. Prices are between 55 and €70 for the TGV full-fare, with night train fares starting at €15 one way. Buses arrive on square d'Ixelles, in the centre of Biarritz. There are buses from Bayonne, Anglet, Pau, Saint-Jean-de-Luz, Hendaye. Spanish bus company PESA  run a twice-daily service (leaving from outside the Biarritz Tourist Office) that follows the coast to San Sebastian and Bilbao in Spain. Bruxelles - 2 flights a week with Ryanair. Rotterdam - 3 flights a week with Transavia. Geneva - one flight operated by Air France during the summer. Dublin - 4 flights per week with Ryanair - flying time 2h. London Heathrow - 3-4 flights a week with British Airways. London Stansted - daily flights with Ryanair  - flying time 1h 45min. Lyon - daily flights with Air France - flying time 1h 20min. Madrid - daily with Iberia operated by Air Nostrum - flying time 1h. Marseille - with Air France. Nice - daily flights with Air France - flying time 1h. Paris Charles de Gaulle - 3 flights a day with Air France - flying time 1h 20min. Stockholm Arlanda - 4 flights a week with Scandinavian Airlines during the summer. You can get to the city from the airport by bus or taxi. A single bus fare is approximately €1.5. You can pre-book a Biarritz Airport Transfer with Sea-Lifts  - book online or call the English/French/Italian speaking service. Or book a door-to-door transfer with Biarritz Airport Transfers . 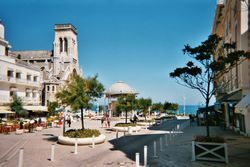 Biarritz is very pedestrianised, and it is easy to get around the town centre, to the beaches, and to the best spots for surfing or shopping. This means whatever your holiday needs is a short and pleasant walking distance away. However, it can be quite hilly in places. There is an excellent bus network, since 2011 called Chronoplus ([[]] for timetables and routes), serving Biarritz as well as the neighbouring Anglet and Bayonne (which form a conubation called 'BAB'). Bus journeys are a flat one euro (€1) payable in cash on the bus.This ticket is valid for one hour to allow passengers inter-change between bus services and routes. Cheaper multiple journey tickets are also available from the bus kiosks at Biarritz Mairie (beside the tourist office) and at Bayonne Mairie, but cannot be bought on the bus. These include a 10-journey ticket (€8); a seven-day travel pass (€11); and a 24-hour pass (€2). These tickets are also sold at 39 tobacco shops/cafes in the Biarritz-Anglet-Bayonne (BAB) area. Bus Line C links the airport with the Biarritz train station at La Negresse and the main Bayonne train station. The slightly less frequent No 8 bus also serves the Airport every 20-30 minutes. Biarritz is famous for its coast and the rocks in the sea. There is the church of Sainte Eugenie, a Russian Orthodox church, and the Museum of the Sea (entrance about €6) with a lot of interesting animals like different kinds of fish, anemones, sharks, and seals in aquariums. Other topics include fishing in the last centuries, birds, catching whales. Then there is a Museum of Asian Art and a lighthouse (entrance €2). The beaches are excellent and this is a major surf resort. The main beach, Grand Plage, gets very crowded, but there is also a long surfers' beach on the Boulevard du Prince de Galles, called Cote de Basque, that has almost no sand at high tide, but is superb at low tide. The surf beaches at Anglet are easily accessible by bus, and surfboards that aren't too big are allowed on the local buses in the summer at least. There is a small beach by the Esplanade du Porte Vieux that is good for swimming when the surfer's beach is closed. There are several thalasso-therapy centers, with sea water, seaweed and related treatments. Thermes Marins, Rue de Madrid. Offer a reasonable half-day pass for € 17, including use of warm sea water pools, sauna, and steam room. The sauna is rather worn, but serviceable. Biarritz Olympique  plays rugby union (15 a side) in the French Top 14 competition, and is also a regular competitor in the Europe-wide Heineken Cup (referred to as "H Cup" in France due to restrictions on alcohol advertising). BO play most of their home games at the Parc des Sports Aguiléra in town, but will take an occasional home match across the Spanish border to Estadio Anoeta in Donostia-San Sebastián. Ticket information is available here (French only). Central Market, rue des Halles. Has a wide range of fresh food, and is well worth a visit even if you don't want to buy anything. It is only open from 7:30 to 13:30. Galleries Lafayette, Place G Clemenceau. Has a large and decently priced supermarket in the basement. Aux Alizés - La Table Basque, 4 av de Marne, Tel: 05 59 22 23 52. Has a very good and Basque-influenced carte and proper 3-course menus at Euro 17 and 22. Closed Tuesday and Wednesday evenings. Many of the more tourist-orientated places have quite poor prix fixe menus. Pizzeria des Arceaux, 20-24 avenue Édouard-VII, Tel: 05 59 24 11 47. Pizzas all seem to be either Euro 9,80 or 9,90. An odd pricing scheme, yet the pizzas are very good, as is the fish and the large desserts. Closed Monday. There are several places to go clubbing in Biarritz. One example is a great club called Le Copa located in the centre of the town. At the same place you can find many bars, as a pub crawl night is a must if you visit Biarritz. Another good club is the one under the Casino, and the best thing of all is that it is for free and does not close at two or three o'clock like the bars do. Surf Hostel Biarritz  Ave de Migron, Tel. +33 05 59 22 55 70. Surfer accommodation with bed + breakfast + bike + board all incl. €36. Hostel Biarritz(Hostelling International) , 8 Rue Chiquito de Cambo, Tel. +33-5-5941-7600. A bit out of the way. Hôtel Atalaye, 6 rue des Goélands, 05.59.24.06.76, . All en-suite hotel, the best rooms (including a few tiny singles) have small balconies and face the place and sea. Singles € 35-€ 50, Doubles € 42-€ 70, Triples € 55-€ 84. Hôtel Gardénia, 19 av Carnot, 05.59.24.10.46, . Two-star, old-fashioned and quiet hotel with a mix of rooms, not all with their own bathrooms. Singles € 33-€ 57, Twins € 49-€ 59, Triples € 51-€ 63. Hôtel Maïtagaria, 34 av Carnot, 05.59.24.26.65, . Mostly smart rooms in a quiet location, with back garden. Doubles € 47-€ 64, Triples € 74-€ 80. Hostellerie Victoria, 12 av de la Reine Victoria, 05.59.24.08.21. More expensive hotel in a Neo-Gothic mansion, huge rooms equipped with comfortable beds and iron bathtubs. Hôtel du Palais, 1 Avenue de l'Impératrice, . Sits on a cliff overlooking pristine sands just steps from the town centre of Biarritz. The hotel offers 30 luxurious suites and 123 bedrooms, two fine dining restaurants, including Michelin-starred Villa Eugénie and a luxury Spa centre. Biarritz is a great place to learn French. There are several French language schools located in Biarritz, offering courses for adults all year round or running summer language camps for teens during summer. Bayonne, the Pyrenees, and Spanish border towns such as San Sebastian are all easily accessible from Biarritz. This page was last edited on 5 March 2016, at 18:17.